A few months ago, we wrote a post about how most of what we buy – specifically food – is Australian. At the end of it, we said that though we were willing, or even happy, to exist on Aussie fare and the odd import, one thing we wouldn’t be getting was maple syrup because it was too expensive. Just how expensive? 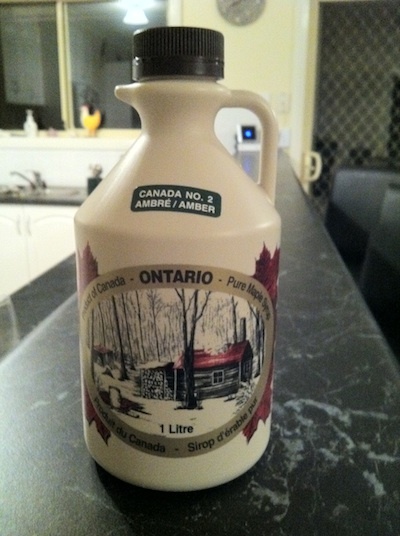 At the ocanada.com.au website, a one litre jug of amber maple syrup is $55.99! That is almost 3 times what it costs in Canada…we know that because we bought some in Lion’s Head last week. And what we bought wasn’t just any generic Quebec syrup; it was made in Kemble, near where we grew up. So not only is it good, it has sentimental value. A well-spent $20 at the Lion’s Head farmers market. We foresee blueberry pancakes in our near future. Maple syrup would be the obvious shopping choice for any Canadian to bring back to Australia and it was easy to get into the country…the customs guy just smiled and waved us along. But it was only one of five items on our shopping list for while in Canada, on our quest for things we can’t get here, or can’t get at a good price. What were the others? Let’s see, what is uniquely Canadian? Nanaimo bars? Probably wouldn’t get past customs so easily. Date squares – same problem. Kraft dinner? Ick! Maybe some bison steaks…the quarantine sniffer dogs would love those! We thought about bringing back some ice wine, but prefer the Rutherglen stickies. First item we needed was a SIM card to get an iPad online. This sounds simple, but was a huge challenge. Apple Canada says go to Rogers…but Rogers wanted a Canadian credit card (we have one), a Canadian address (we don’t have one), and it seems also a Canadian iPad. Whatever that is…after almost 45 minutes on the phone with their tech support, Lisa gave up when they said her Australian iPad wouldn’t work on their network (it must have been upside down…but seems pretty stupid for customers from other countries not to be able to get pay as you go). By chance, we happened to walk by a FIDO kiosk and asked them. When the guy finally stopped laughing when we told him Rogers thought the problem was that it was an Aussie iPad, he explained that they don’t have data-only packages, but would sell us a phone package with data. Same SIM, you just don’t use the phone component on the iPad. Lisa has worn her pretty new shoes (that Dan picked out for her) once so far, and received numerous compliments. Then we got this smart idea to buy a cheap phone from them, so now when traveling in Canada we have a Canadian phone number, just have to switch the SIM from the tablet to the phone when we want to use it. And it was cheaper than what Rogers tried to set up for us! And took about 10 minutes. And he didn’t ask for an address. Anyone who knows Lisa won’t be surprised to hear that she bought shoes. 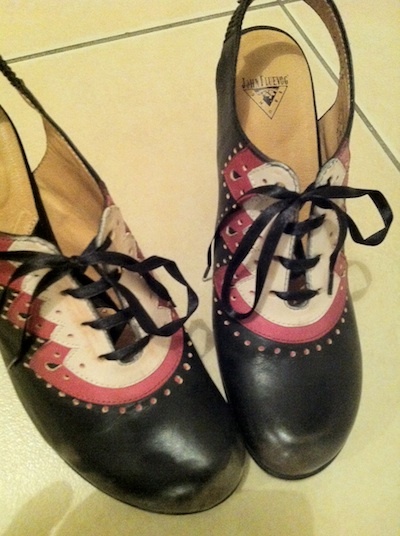 Or, more specifically, Fluevogs. We had a one day layover in Vancouver, so went straight to the source. Yes, there are a couple of stores in Australia that sell them, but the selection isn’t as broad as at the actual Fluevog stores, and the prices are a bit outrageous here. So, two new pairs of funky shoes came home with her. Not to be outdone, Dan also bought two pairs (he really wanted to replace his Micahs, but they have stopped making them 😦 ). We also found it interesting to see another person shopping there, suitcase in tow… According to the salesperson they get a number of people who pop in to buy shoes while waiting for flights (the good ol’ Skytrain can have you downtown and shopping within about 30 minutes! A good reason to book your next flight with an extended layover). We also learned that there is a rumour that John F. might open a new store in Oz soon… probably Sydney or Melbourne, but perhaps we can lobby for a store in Wagga Wagga? Let’s start the online campaign/petition now!! Dan hasn’t received any compliments on his new Fluevogs. 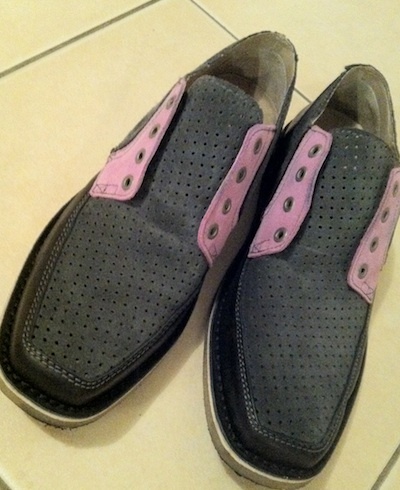 Waggans aren’t sure that a guy should wear shoes with pink highlights. The next stop in Vancouver: Mavi for jeans. They are hard to find here – not just in Wagga, but even in Melbourne there wasn’t much of a selection. And Mavis are good jeans and good value…unless you pay the $160 or so a pair in Australia. Again, two pairs each. Good thing we took a lot of TimTams to spread around among family, cleaning out room in the suitcases for the clothes. FYI – these bikkies are so good they even have their own Facebook page! And then the really odd shopping trip – London Drugs to buy deodorant. Yes, deodorant. It seems like something that shouldn’t be a problem getting here, but it is a bit of a challenge getting what we use. Lisa’s ultra-sensitive Dove for girly-pits is very expensive here – upwards of $16 per stick. So she stocked up on it in Vancouver at about $6 each. Dan has an even bigger problem. For one, he can’t use scented products so Axe and all that smelly crap is out of the question. 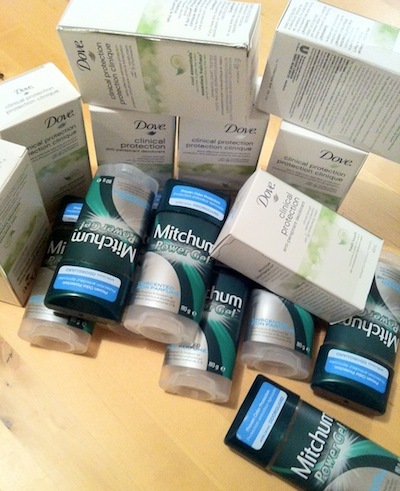 So his deodorant of choice is unscented Mitchum. But the bigger issue is he can’t find gel in Australia. Just roll on. Roll on?!?! Yes, roll on. Didn’t even know they made it any more. Or maybe they don’t, and Revlon (did you know that Revlon owns Mitchum?) shipped all their unsold roll-ons here in 1995 and there are still some left! Add a bit of sudafed and some butane, and this stuff could be addictive. And luckily, London Drugs happened to have just what he wanted, on sale! The cashier probably thought we were nuts, buying a year’s worth each. But then again, this was in downtown Vancouver, so she probably sees a lot stranger purchases…pretty hard to get high off of deodorant. Especially the unscented kind, though there is probably a store policy that they have to call the cops if anyone tries to buy a dozen Axe body sprays. This entry was posted in Canada, cultural differences, farmers market, maple syrup, shoes, shopping, travel. Bookmark the permalink. Good choice in shoe Dan! If I saw you wearing them you’d get lots of praise. It’s great to read this as I do exactly the same thing when I go back to the US!!! After more than a decade of living here you’d think I’d be adjusted to “Aussie” brands here. I have similar difficulties with the deodorant and typically this is what I buy too — as well as shoes and jeans — which as you say are so expensive. Plus if you’re a curvy girl the sizing just doesn’t seem to work here. The food things is more challenging though because some things that are the exact same brand here are not the same product you can get in the US…Doritos for example, are different even though they look identical. Over the years you simply accept this is how it is and adjust. Too bad our bodies don’t adapt though for the clothing and personal goods as it would really make traveling home so much lighter!